Japanese RPGs used to be a lot more controversial. Or maybe it was just because I was a teenager during the genre's heyday – you know, when Final Fantasy games flew off shelves, when hours of CG cutscenes featuring teary-eyed androgynes were considered breathtaking rather than tiresome — and teenagers like to argue about things on the internet a lot more than people my age can stomach. Chrono Trigger would have been quite a tough act to follow. I know tons of people who think it's high on the list of the best RPGs of all time, if not the best. Its story of the world through ages, tasking players with time traveling in order to repair rifts in the continuum – and ultimately to save the world from Lavos, an alien threat that sleeps deep within the planet – was unique for its time, and the fact Chrono Trigger's rich world offered players so many complex and intuitive choices gave it a permanent place in many players' memories. Chrono Cross is only tied to the world of Trigger loosely; the references that connect some of the game's story and places to Chrono Trigger's are generally subtle and kind of hard to parse. Even today, fans want sequels to the games they love and not "spiritual successors"; gamers find it hard to stomach the continuation of a franchise when key recognizable elements are considerably changed. That's understandable. But replaying Chrono Cross lately, I become increasingly convinced that fan adoration of Chrono Trigger led to the unfair dismissal of a work of worthy beauty. 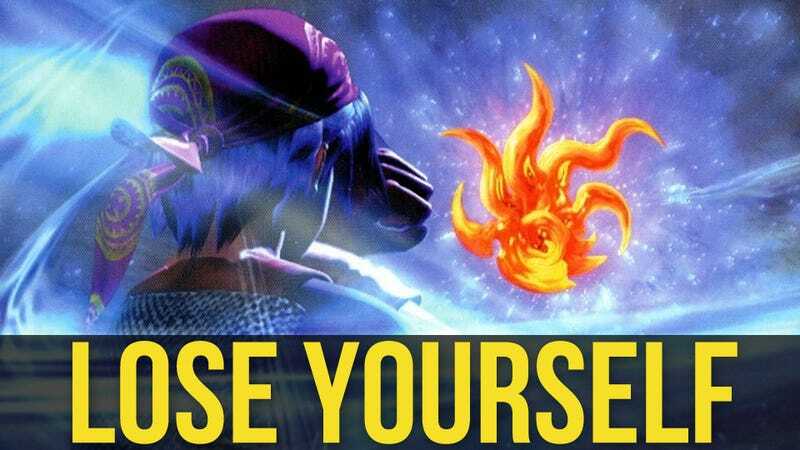 Perhaps the story and the gameplay of Cross aren't as strong – or, more specifically, they aren't strong in the same ways that Trigger is – but what's most special about Chrono Cross is that it tells its story through tone and aesthetics, through a vast sense of quietude, loneliness and alienation that it stages against an impeccably beautiful oceanic landscape. At the game's opening, silent protagonist Serge stumbles into an astral rift on the seashore of his home village. In town, subtle things are just a bit different: The town has a different chief. A coffee shop girl committed to a career in poetry has abandoned her dream. And in your house, you don't find your mom waiting for you, but a bristly stranger who's never heard of you. Your childhood friend, Leena, is still waiting on the dock where you left her just a little while ago to go and gather scales to make her a bracelet. Except she doesn't recognize you – and she doesn't understand how you'd be mean enough to pretend to be someone she sort of knew who died as a child. Later, at the zenith of a cliff that overhangs the quiet, dispassionate sea, you find your own grave. As I told Kirk, the reason I love the game's music so much is that it so often captures the sound of being adrift, of feeling lost, of beautiful grief. It also re-uses motifs to great effect – for example, the theme song for your home village is different in Another World than it is in the Home World; it's a slower arrangement, but the melody is nearly the same. Loyal fans of Chrono Trigger can even pick up some of that game's musical motifs sprinkled around the world of Chrono Cross. But my favorite thing about Chrono Cross is the ocean. The visual direction for the game is very strong, very considered; the adventure is distributed across a raw, wild land dug into a massive ocean. There are jewel-green forests hung with eerie phosphorescence, and magma-veined mountains that smolder with a glowing heat you can nearly feel, but the sea is everywhere in this game. From some vantages it's royal and endless, and in others it's glittering shallows, marine green, resting docile around the villages that have built themselves into it, that coexist with it. Exploring the world of Chrono Cross is a delight of bright corals, of mysterious foliage that arches high over swamplands like the spine of a fish, and of quiet white sands where you can buy some silence, alone with the sighing of the waves. It's funny, then, that one of the least formulaic JRPGs I can think of – and truly, one of my very favorites – went so overlooked. But Chrono Cross is special. That it contains so many disparate and seemingly-random recruitable party members – though a few are key to the story – seems to be considered by gamers to be a weakness of the game, but narratively it's effective, enhancing the player's empathy for Serge's isolation. Each person has his or her own goals; the game contains no grand messages on love and friendship and unity. It isn't particularly directed, either, with rewards sometimes to be found for simply exploring areas on one's own. It's easy to forget one's objective, to feel lost. The result is the game feels like an essay on self-discovery, a process that is inherently lonely and often sad. Remembering back to that JRPG heyday, when people were too loyal to their favorite titles to give Chrono Cross much of a sporting chance, I feel a little nostalgic. And I think about why JRPGs seem to have lost some of their luster, and one of the bigger reasons I can come up with is that we got fatigued of the formula. It's funny, then, that one of the least formulaic JRPGs I can think of – and truly, one of my very favorites – went so overlooked. Lucky thing it's on PSOne classics for you guys to check out if you missed it.